This week's five AHAs are from the AHAbook™ Leveraging NetSuite & Your Mobile Device to Make More $$$. Please share this URL "aha.pub/LeveragingNetSuite" in your social media status update to let your friends know about it. The Kindle version of this book can be downloaded for FREE on April 24th-28th! Get your FREE copy here: http://getbook.at/LeveragingNetSuite. Companies spend hundreds and thousands of dollars for systems like NetSuite, which do a great job addressing the core business processes but sometimes lack the components necessary to drive customer delight in the last mile. Integrating SignNow into NetSuite can help. 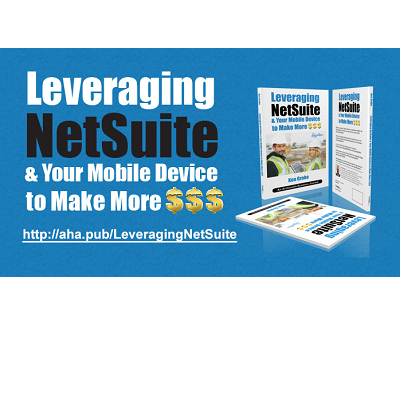 Leveraging NetSuite & Your Mobile Device to Make More $$$ is a book written by Ken Grohe that contains 140 helpful quotes that will enable your org to be closer to your customers and cater to their needs real time via mobile devices. With SignNow, they can go from customer to customer and provide change orders on the spot, which saves the customer’s time and makes them feel like they’re important to the company. To see and learn how to automatically share AHAmessages from this book, you may check out this video: https://youtu.be/RkUuk6_C_m8. To learn how to automatically share via AHAblaster, please watch: https://youtu.be/XmApzpAKGag. If you like the AHAthat and would like to let your friends know about it, you can do so by filling out the fields and clicking on Submit. After you click, we will automatically send an email that contains your name as it’s registered in the AHAthat. Thanks for using and liking our tool enough to want to share it. We really appreciate it and have made it so that telling a friend also counts towards the social media count that unlocks a new book. So, please share often.